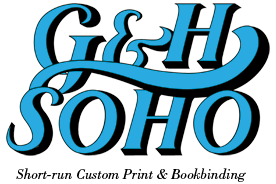 With 30 years in the printing and binding services industry, G & H Soho is the book printing company of choice throughout the New York metropolitan area. Whether you’re looking to finally get your novel out in the world or if you just want to test the waters with some short run or small run book printing, G & H Soho is the local printer you can trust. No printing or binding details are overlooked and our staff cares about the high quality of work that goes into your project just as much as you do. It’s time to get your book your way. It’s time to call G & H Soho to get started. G&H Soho is always making headlines in the print industry. Read about what we are doing to stay a prominent figure in the evolving printing & binding industry. -G&H Soho expands its printing capabilities! -G&H Soho Buys 3-knife trimmer! -G&H Soho: Prism Paper Cutter!